During a discectomy, the pieces of a herniated disc that press on a nerve or on the spinal cord are surgically removed. Discectomies are done when a herniated disc is causing pain and/or other symptoms including numbness, weakness or electrical sensations down one leg or arm. When a herniated disc is the cause, these symptoms are called radiculopathy, but many non-medical people refer to them as sciatica. When you have a discectomy, all or part of the lamina, which is an area of bone at the back of the vertebra, also has to be removed. This is to enable the surgeon to reach the nerve and disc. Depending on how much bone is removed, this aspect of the procedure may have one of two names. A laminectomy removes all of the lamina, while a hemilaminectomy removes only half of the lamina. Most of the time, conservative methods such as medications, physical therapy, or steroid injections are tried before surgery. In fact, a herniated disc often heals without surgery at all — but this can take up to a year. Having a discectomy may greatly shorten your healing time. If your pain is intense, or the weakness/numbness is noticeable, a discectomy may be a good choice, but if your symptoms are mild or moderate, therapy may be all you need. Either way, discuss your symptoms and options with your doctor. Microdiscectomy is a minimally invasive procedure performed in an outpatient setting. A very small incision is made in the skin and tiny tube-shaped implements are inserted all the way in until they reach the disc. The entire surgery takes place through the implements. During a microdiscectomy, muscles are not cut as they are during an open discectomy; instead they are moved out of the way. Because of this, healing time is generally faster and less painful than with an open procedure. Open discectomy involves making an incision that is approximately 1" long; the muscles have to be cut to give the surgeon access to the disc. As discussed above, this generally means more time for post-surgical healing will be needed. Post-surgical healing after open procedures can be more painful, as well. Other than the differences and difficulties in the post-surgical healing period, the two procedures are comparable. A small 2011 study published in the Journal of Orthopedic Surgery (from Hong Kong) found that both open discectomy and minimally invasive discectomy were equally effective in relieving symptoms. But, the authors say, the minimally invasive surgeries required shorter hospital stays, earlier returns to work and recurrence of the original problem. That said, the authors caution that minimally invasive discectomy techniques are very demanding on the surgeon, and require specific training. Both orthopedic and neurosurgeons perform many kinds of back surgeries, including discectomies. Either type of doctor will be well prepared for the job. The choice of a surgeon for a discectomy really comes down to your evaluation of the individual's skill level. Don't hesitate to ask many questions before deciding who exactly will do the procedure. Discectomy works about 80 to 90% of the time and usually results in rapid relief of leg pain and other symptoms. Benefits of discectomy hold steady over time — a study published in Spine journal found that most surgery patients enjoyed complete pain relief even after 10 years. And a 2017 study published in the November 2017 issue of the journal Clinical Orthopedics and related Research found that over ninety-three percent of discectomy patients were faring nicely seven years after the procedure. The possibility of a recurrence of the herniation is a real one. A 2015 systematic review of studies, found that after two years, pain may recur in up to 25% of patients who underwent a one-level discectomy. The authors say that of these, about 6% needed re-operation. The good news is that surgery for the recurrent disc herniation is not always necessary. Again, studies show that surgery and conservative care for a subsequent herniation after a discectomy get about equal results in terms of pain relief. Along with the potential for reherniation (discussed above) discectomy risks include infection, bleeding, injury to the dura mater, which is the covering around the spinal cord, or injury to nearby nerves, arteries or veins. If you notice redness or discharge from your incision, pain or weakness down your arm or leg, you become feverish, have problems urinating or are bleeding, call your doctor immediately. 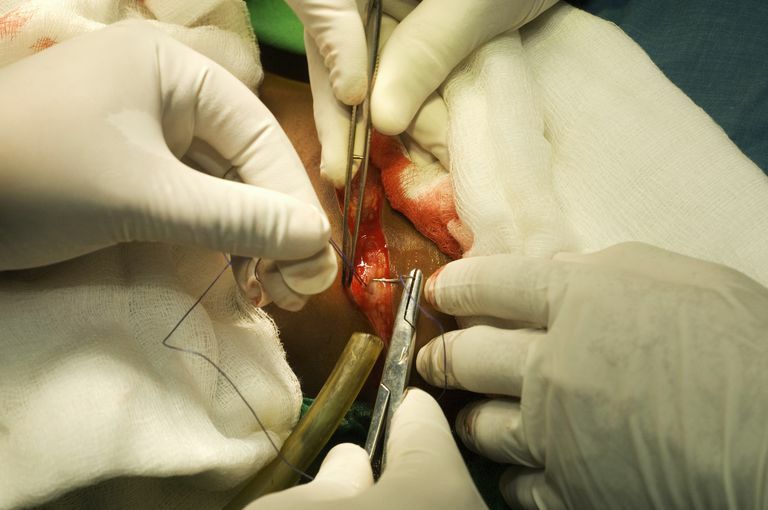 You may have post-operative pain at the incision site immediately following the surgery. Pain from your herniated disc may linger for a while, too. It's a good idea to start walking as soon after your procedure as you are able. This will likely help speed recovery, prevent scar tissue and mobilize your spine. Within a couple of weeks, you should be able to ride a bike or swim. Most people get back to work in 2-8 weeks, depending on how physical their job is. Physical therapy can assist you in a speedy return to work and other activities. If your doctor doesn't refer you to PT, you might consider asking her about it. Many patients, especially with a first discectomy, make a full recovery. Dewing et al. The outcomes of lumbar microdiscectomy in a young, active population: correlation by herniation type and level. Spine (Phila Pa 1976). Jan 2008. NASS. Open Discectomy. NASS. Burr Ridge, IL. Accessed: Feb 11 10. Legrand et al. Spine Section of the French Society for Rheumatology. Sciatica from disk herniation: Medical treatment or surgery? Joint Bone Spine. Dec 2007. Virk, S., et. al. What is the Rate of Revision Discectomies After Primary Discectomy on a National Scale? Clin Orthop Relat Res. Nov 2017. How Does Obesity Cause a Herniated Disk and Back Pain?